The number of high-end productions which film over a longer period of time has doubled, and this has proved to be a box office smash for the local economy, generating a massive £16.1million – more than a £5million increase on 2017. 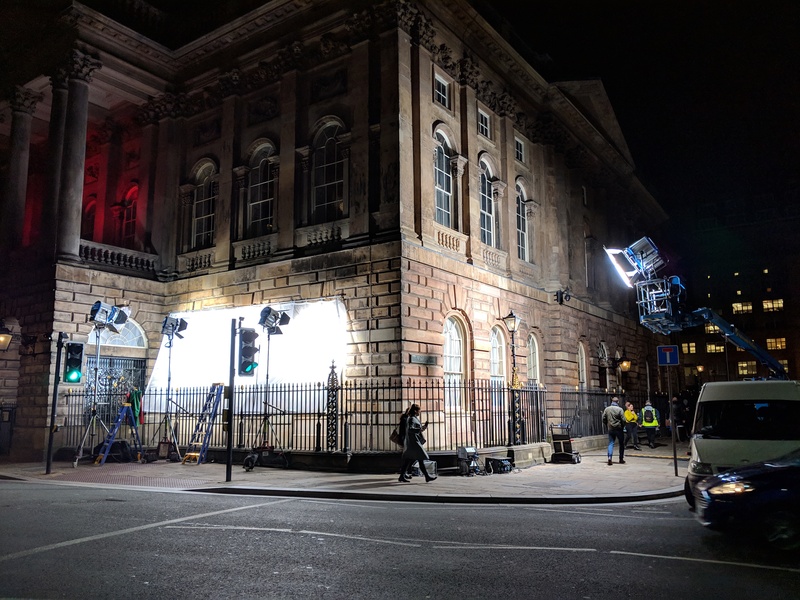 Examples of the high-end productions which have filmed on the city’s streets in 2018 include BBC primetime drama The War of the Worlds, Sky1’s Bulltetproof starring Noel Clarke and Ashley Walters, Jimmy McGovern’s Care and leading ITV drama Anne written by Liverpool writer Kevin Sampson. During the year, Liverpool welcomed royalty as two queens headed to the city with Victoria and The Crown, and Sir Paul McCartney was shotgun in Carpool Karaoke, filming in various city locations with James Cordon, viewed by a worldwide audience of more than 100 million people. Merseyside continued to be the star of the silver screen as Danny Boyle and Richard Curtis shot their latest film here which stars Ed Sheeran. Three international feature films were also shot on location here, hailing from Germany, Austria and China. Familiar faces were also on the scene as cult hit Peaky Blinders made its return along with BBC’s Moving On and ITV’s award winning comedy Timewasters. Deputy Mayor and cabinet member for culture, tourism and events, Councillor Wendy Simon, said: “These figures are incredible and we can safely say Liverpool is maintaining its crown as one of the most film friendly cities in the UK. “The calibre of productions coming here is incredible, and the boost this then has on our local economy is invaluable. “Every day, Liverpool Film Office is approached from production teams across the world, looking to film in the city region. We have a unique offer – a huge and diverse number of potential locations, combined with the professionalism of the small film office team who really do go above and beyond to attract projects to the city. Betsan Morris Evans, Producer for the BBC’s production of The War of the Worlds, said: “We had a fantastic experience filming in Liverpool – the Film Office made our time in the city so easy – from closing roads and helping source key locations, it really was a wonderful working relationship. Lynn Saunders, Manger of Liverpool Film Office, said: “At the moment the UK is experiencing an unprecedented increase in the volume and scale of broadcast and digital content being producer. “Thanks to platforms such as Netflix, Amazon and Hulu, there is a ferocious appetite for content, but with this comes increased competition from other areas of the UK and Europe who are all keen to attract as many projects as possible. “Liverpool is more than holding its own, and more often than not, people from the film and production industry who contact us for the first time, are doing so as the city has been recommended to them by other industry colleagues – and we can’t ask for much more than that. “I’m so proud of our small team, but as always, we don’t rest on our laurels and are always looking ahead to next year to see what we can do to improve, and make sure Liverpool is always on the mind of producers and directors looking for locations. Head back to Homepage here.